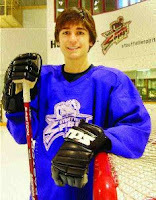 2008 recruit Corey Trivino’s overtime goal gave the Stouffville Spirit a win tonight in the decisive seventh game of its OPJHL North conference semifinal, 5-4. The 6-1 center assisted on three other goals as the Spirit eliminated favored Huntsville, a team that had lost just seven times in the regular season. Spirit took a 3-1 lead, fell behind, 4-3, then tied the game late in the third period. 2009 recruit Ethan Werek assisted on Trivino’s gamer and on the Spirit’s second goal. Trivino leads his team in playoff scoring with 4-14-18, followed by Werek at 6-10-16. Next up: conference final against Aurora. Another 2008 recruit, goalie Kieran Millan continue his strong play over the weekend as Spruce Grove (AJHL) finished off first-round opponent Lloydminster in a 6-3 win. In three games, he’s yielded four goals—just one at even-strength—and sports a 1.33 GAA and .957save percentage. BU’s other goalie recruit, Grant Rollheiser didn’t fare as well as his Trail Smoke Eaters (BCHL) were overpowered in three games by the Vernon Vipers. The season also ended for 2008 recruit Ross Gaudet, whose EJHL Bridgewater Bandits fell in the first round to the Jr. Bruins. Gaudet, a former Boston Globe All-Scholastic from Austin Prep who scored the last goal of the year for the Bandits, finished the regular season with a 13-15-28 line. Terrier reshman Colin Wilson was named Hockey East’s Rookie of the Month for February. BU Today takes a look at Chris Drury, the New York Rangers’ $35-million man. The Globe's Jim McCabe examines the phenomenon of the vanishing 18 year old freshman hockey recruit, with Coach Jack Parker extensively quoted. Finally, The Boston Globe’s fine hockey writer Fluto Shinzawa returned to the Daily Free Press for a guest column, reflecting on his time spent at BU as a Terrier hockey fan and reporter.